Facebook Privacy Settings Bug – Check Your Recent Posts! 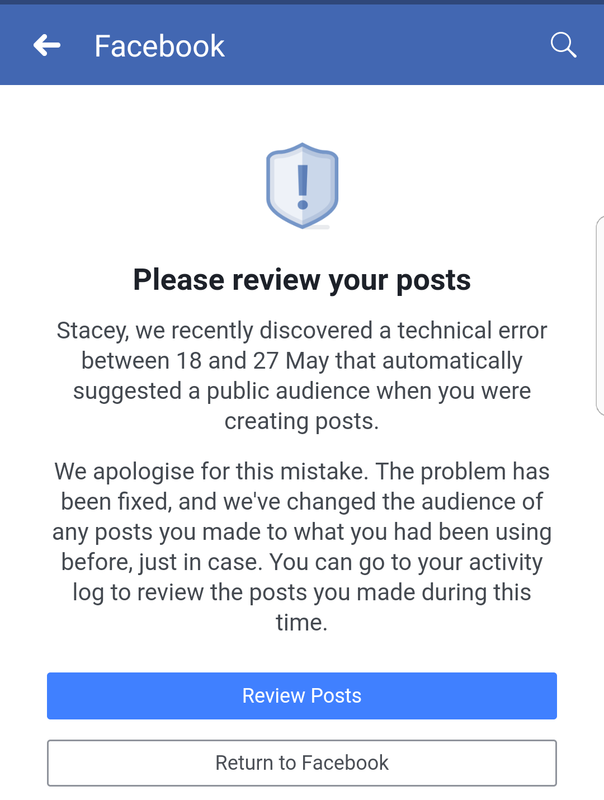 Facebook has apologised for a bug that caused users’ default privacy settings to be overruled and their posts set to ‘public’ rather than ‘friends only’. 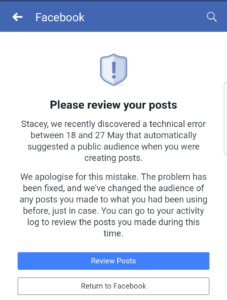 If you post often on Facebook, there’s an easy way to check for posts that have accidentally been set to public rather than scroll through your whole news feed. You can select to view your profile as a member of the public – i.e. not one of your Facebook friends – and this will show you which posts have been set to a low privacy setting. On the mobile app, view your own profile and then click the eye symbol that says ‘View As’. On a computer, select the 3 dots next to the ‘Activity Log’ button and select ‘View As’. This shows you your profile as a stranger can see it. If you’ve never checked your default post settings, this is the perfect time to do it. Take a minute to do a quick Facebook privacy checkup (instructions here). Make sure you set your ‘next post’ option to ‘friends only’. If you have any posts you want to be seen by anyone and everyone, for example for work, charity, events, awareness etc. then just set those posts to ‘public’ when you write them.